Dome arrays are also a great way of enhancing the tactile feel of a rubber keymat or simply sticking directly to a pcb with an overlay to create a tactile switch effect. We are able to offer an extensive range of dome array designs from simple single layer PET dome arrays to those requiring spacers and EMI shielding layers. 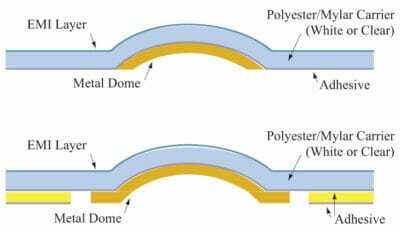 One of the most original styles of dome array where the domes are placed on a layer of PET film with an adhesive layer. Holes or kiss cuts are required around the dome to assist with the breathing of the dome there by maintaining a good tactile effect. 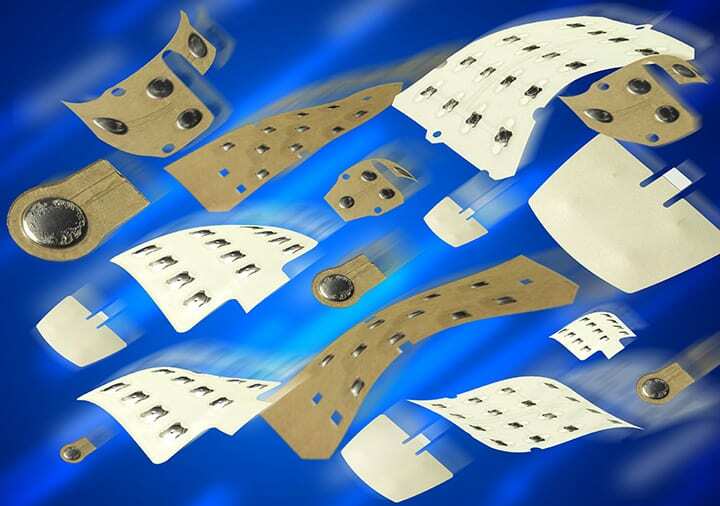 An ideal low cost solution to stick straight to the PCB. Here the construction method is similar to the two above but in addition a layer of silver or carbon paste is printed to provide EMI/RFI shielding to the top of the PET film. Utilising the construction options above we can add an additional layer of Rubber Glue which is ideal for use with rubber keypads providing enhanced adhesion characteristics. With this type of construction a spacer layer is incorporated into the assembly. Venting for the metal domes to breath can be incorporated into the spacer layer if required. Varying thickness and materials can be utilised for the spacer material. Dome Arrays can be manufactured as simply as say one or two domes on a polyester backing to large panels which may incorporate a large number of domes in a pattern to suit a custom application. Different size/types of domes can be incorporated into the array design. A dimensioned drawing with construction requirements along with dome sizes and parameters and yearly quantities are needed to make an offer. Budgetary pricing can be provided from hand sketches if required.